This hardcover picture book in the New York Times bestselling Ladybug Girl series explores themes of making friends, compromise, and imaginative play at that favorite preschool place—the playground. Lulu and her dog Bingo meet up with Sam on the playground and want to play together. Sam likes the sandbox but Lulu thinks the monkey bars are better. 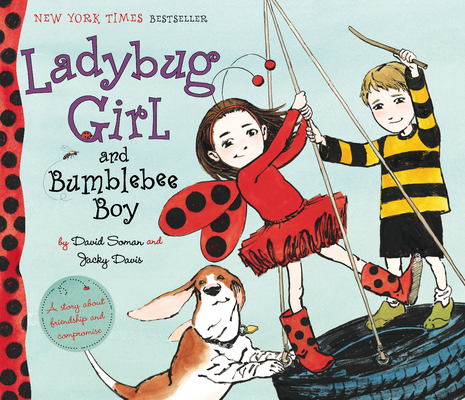 They just can’t agree…until Lulu asks, “Have you ever played Ladybug Girl?” Quickly, Sam becomes the brave Bumblebee Boy, and he and Lulu, a.k.a Ladybug Girl, are superheroes who save the playground from scary monsters and mean robots. New friends want to join their game too, and soon the Bug Squad is formed with Ladybug Girl, Bumblebee Boy, Dragonfly Girl, and Butterfly Girl using their imaginations to keep the playground safe. For fans of Toot and Puddle and The Amazing Adventures of Bumblebee Boy, the Ladybug Girl series honors friendship, cooperation, and a love of the outdoors!